Is adaptation to climate change forgotten in Central Africa? BOGOR, Indonesia (22 August, 2011)_Forest user groups that are dominated by women are less likely to adopt sustainable forest management practices than those groups that are mixed or dominated by men, according to a recent study. “The study challenges the traditionally held view that, because women are more dependent on forest resources and spend more time in the forest, that they are natural ‘conservators’ and more likely to engage in sustainable forest management.” said Esther Mwangi, CIFOR Scientist and co-author of the recent article ‘Gender and Sustainable Forest Management in East Africa and South America’, in Ecology and Society. 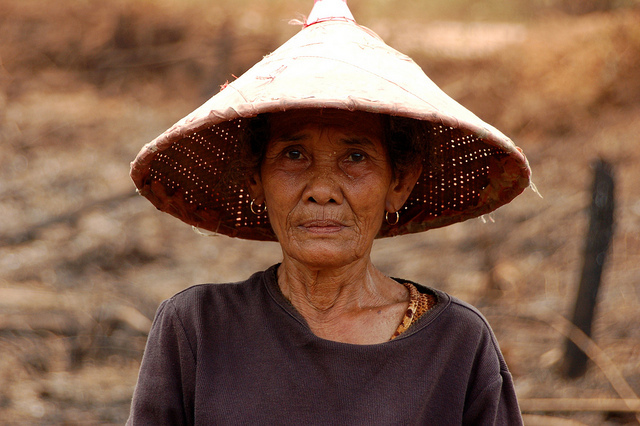 Instead researchers at the Centre for International Forestry Research and the International Food Policy Research Institute found that gender biases in technology access and dissemination of new forestry methods, labour constraints and the limitation of women’s sanctioning authority, were possible factors that limited the ability of women to engage in sustainable forest management practices. The study highlights the need for further research into how the complementary skills sets of both men and women could be used to protect forests from deforestation and degradation which will be vital if climate change mitigation schemes, such as REDD+, will work. Traditionally, women have been seen as the main and most frequent collectors of forest products, and with the added responsibility of feeding a family, more burdened by the deterioration of the forest. Previous studies which have examined the role of women in community forestry found that, when included, women have been successful in restoring degraded lands. The research suggests that unlike men, who mainly specialise in timber production, the vast array of forest products collected by women is said to result in increased monitoring and conservation of forest resources. Women also tend to adopt more environmentally friendly practices, such as terracing and taungya, the cultivation of fodder trees and lead campaigns against tree grazing. However, despite an increased recognition of the role that women play, gender biases still marginalise women and their participation in community forestry. Women tend to be excluded from decision making and are less likely to see the benefits. They are mostly involved in decision making when trees and forest are already degraded or as negotiators in conflict. Studies have shown that securing women’s land rights is a powerful incentive to conserve forest, but often these rights are not formally recognised, and women are generally allocated much smaller plots of land to manage. A lack of education, employment and access to networks means that women are at a disadvantage when it comes to influencing key decisions in community forestry and the sustainable management of the forests. The study made a comparison of 151 forest user groups in 67 forest sites across East Africa and Latin America from 1993 until 2003. It examined how different forest users comprising of ‘low’, ‘medium’ and ‘high’ proportions of women were engaged in sustainable forest management techniques. These included; the adoption of new technologies to reduce forest dependence, such as bee keeping; techniques to improve the conditions of the forest such as tree planting, regular monitoring and sanctioning to regulate harvesting levels; and conflict management behaviours. It found that female dominated groups were 25% less likely to invest in forest improving technologies compared with male dominated ones. One likely assumption based on previous research was that Forest Extension Officers, who kept communities up to date with the latest forestry technologies and techniques, were much more likely to visit males. Also, many technologies, such as bee keeping and seedling planting, required the purchasing of equipment or seedlings and women often had less control over or access to cash. Gender differences were more prevalent in relation to carrying out regeneration activities. It found that groups with a higher percentage of women engaged in fewer activities, such as tree planting and weeding, than predominately male of mixed groups, as these were more labour and time intensive. The same reason may also account for why women performed poorly in monitoring and sanctioning due to the distances that needed to be covered, and the dangers of patrolling the forest for fear of harassment from forestry officials. Also, men are traditionally seen as the voice of authority to administer fines and penalties when forest rules are borken, whereas women were reluctant to take on this role for fear of jeopardizing relationships. In terms of conflict, although the findings were insignificant across all three categories, it found that a higher proportion of females in user groups decreased incidences of violence which seems to support previous research that demonstrates that women are more likely to develop stronger bonds and have better cooperation. Wealth, forest size and the presence of forest based NGOs or government organisations were much more likely to have an influence on the number of forest conflicts. A ‘mixed’ solution to sustainable development? The authors argue that ‘mixed’ groups could offer one of the most effective solutions to sustainable forest management by exploiting the skills and strengths of both men and women. Mixed groups, could for example, take advantage of men’s’ capacity to harness new technologies and resource management, whilst at the same time benefiting from women’s’ ability to manage cooperation and strengthen group solidarity. It also suggests that in the future, new technologies that that help to conserve the forest should be aimed at women to ensure their adoption, taking into account their time constraints and by providing the skills necessary to ensure its continuation. Men, also need to be made aware of the benefits of having women involved in the management forest. “It is intuitive that men and women working together would produce better outcomes, but given their gender roles and interests, they don’t commonly work together and often use the forest in different ways. We need a better understanding of how mixed groups come about and the interactions and roles of women and men in these groups,” said Mwangi.